Many Democratic candidates have distanced themselves from House Minority Leader Nancy Pelosi in efforts to unseat Republicans in midterm elections this year. Republicans have for years used Pelosi as a boogeyman – and the prospect of that coming to an end terrifies them. WASHINGTON – House Minority Leader Nancy Pelosi is a favourite target for Republican candidates and groups to tie to their opponents and paint them as out of touch, elitist, or excessively liberal – but her fundraising prowess still proves to be a massive benefit to Democrats. While Pelosi has remained adamant that she will stay on as leader and shrugged off the handful of Democratic candidates across the US who have distanced themselves from her, the possibility that she would step down to assume a purely fundraising role is a prospect that terrifies Republicans. 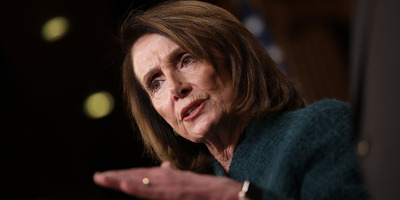 Though Pelosi has been the subject of numerous attack ads from Republicans, she hauled in nearly $US50 million for House Democrats last year, while her Republican counterpart in the House, Paul Ryan, brought in $US44 million. One GOP operative mused that because Pelosi’s stepping down would leave Republicans without their boogeyman, the chances of Republicans retaining their majority in the House would evaporate. And a Republican strategist told Business Insider that it would cause tremendous concern throughout GOP campaigns who use her polarising status as a pillar of their attack ads. But dealing with a Democratic caucus where divided factions would each want to take the top spot could prove difficult, decreasing the likelihood of a leadership change. Several Democrats are waiting in line to become leader when Pelosi’s tenure ends. Reps. Joe Crowley and Steny Hoyer, the House minority whip, are among those looking to the big job promotion in one way or another. Rep. Tim Ryan of Ohio unsuccessfully challenged Pelosi in 2016 but has since warmed up to her. If Pelosi were to depart before the midterm elections in November, and if Democrats could not unify around a new leader right away, the focus could stay on Pelosi. “It’s impossible to see her leaving or her stepping down without Reps. Hoyer and Clyburn promising now to run, which it’s tough to imagine them doing,” a former senior Republican aide told Business Insider, referring to Rep. Jim Clyburn of South Carolina. Rep. Jim Himes of Connecticut told Business Insider earlier this month that Democrats would need breathing room to break with party orthodoxy, as Rep.-elect Conor Lamb did in Pennsylvania by running ads distancing himself from Pelosi. But even though some Democrats would like to see that happen, it might be far off still. Pelosi maintains that she has “a strong following in the country,” citing Democratic candidates who have opposed her and failed in their primary races. But that just isn’t the case everywhere. Nearly a dozen Democratic candidates have already attempted to distance themselves from Pelosi, according to an analysis by NBC News. And a recent survey by The Mercury News of 34 Democratic candidates in competitive races in California in which the Republican holds the seat found that only two were willing to publicly commit to backing Pelosi as leader if elected. Regardless of whether Pelosi stays or goes, she is simultaneously a burden and a boon to Democrats.